It hit 30 degrees outside yesterday amid press reports that the sustained hot, dry spell is destined to continue. There have been some scare-stories about highly-insulated homes overheating but it seems clear that’s a result of bad design, especially in terms of solar shading – insulation is as good at keeping heat out as it is at keeping heat in. There’s a lot of glazing on the south side of the house but that’s shaded by the combination of the overhanging roof (which protects the first-floor windows) and the brise soleil (which shades the big glass doors on the ground floor). It’s not possible to passively shade the windows facing east and west with external architectural features so the internal roller blinds are set to automatically shade those windows when the angle of the sun means it would be shining in. 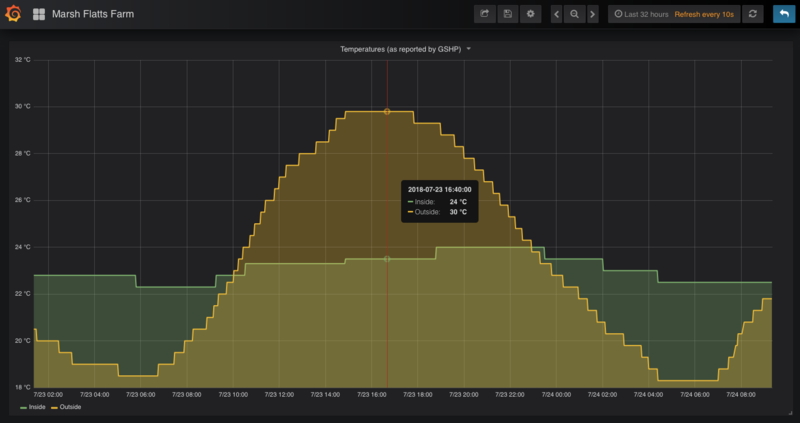 With such high outdoor temperatures and no active cooling there is a natural tendency for the house to heat up so it is necessary to open windows overnight to cool it (which is why the green line on the graph falls away overnight). The line of clerestory windows under the ridge of the roof let the hot air out and don’t pose any security risk. It’s important to keep all the windows closed during the daytime – until the temperature outside is lower than the temperature inside. 30 degrees outside, 24 degrees inside by Marsh Flatts Farm Self Build Diary is licensed under a Creative Commons Attribution-ShareAlike 4.0 International License. This entry was posted in Living in the House by dMb. Bookmark the permalink.